Graeme Dott believes a return to a more carefree style of play has helped him into the UK Championship quarter-finals in York. 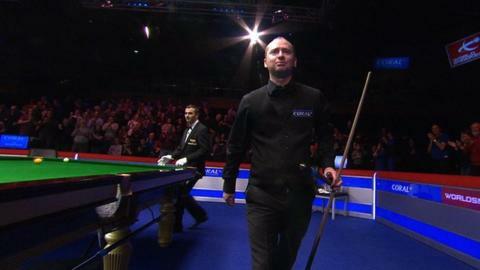 The Scot survived a five-frame fight-back by defending champion Neil Robertson to win the decider. "I've changed back to the way I played in 2010," said the 37-year-old. "I'm just having a go and treating it like I don't really care, even though I obviously do care, and so far it's working." "It's nice to see another Scot coming through. Anthony McGill's got a great future." Dott, who won the world title in 2006 and is currently ranked 17th in the world, next faces Stuart Bingham, who swept aside fellow Englishman Ricky Walden 6-0. "Stuart was more like a journeyman pro, but now he's become one of the best," Dott said of the player who is one year older and is eight places above him in the world rankings. "He's one of the favourites for every tournament, so rightly so he'll start out as favourite. "But I don't care who I play next. I am just delighted to get through. "I will have to play as well as that if not better than against Neil." Dott, who had hammered Robert Milkins 6-0 in the third round, had looked like completing another whitewash until Robertson stemmed the tide. "Everything was going good to go 5-0 up," the relieved Scot told BBC Sport. "I never felt I was playing that well - I felt I cued better against Robet Milkins - but I was still playing OK.
"He let me off the hook in a couple of frames and normally someone like Neil just clears up. "I was surprised to be 5-0 up, but then he started to play the way he normally plays and didn't really miss that much and it puts you under more and more pressure." Dott was joined in the quarter-finals by fellow Scot Anthony McGill, who edged out countryman and former champion John Higgins 6-5. "It's nice to see another Scot coming through," said Dott. "He's got a great future." McGill, 23, had spoken before the match about Higgins being his boyhood hero. "I am over the moon," he said after his win. "I got a lot of luck because John gave me a lot of chances and he doesn't usually do that. "It is definitely the best win of my career. "He is a diamond of a guy. He will obviously be gutted, but he wished me all the best." McGill next faces the winner of Thursday evening's tie between five-time world champion Ronnie O'Sullivan and fellow Englishman Matthew Selt. "I am just glad I'm in the next round," added the Scot ranked 38 in the world. "Regardless of who I get, I'm ecstatic at being through." Read more on Graeme Dott hails last 16 rival Neil Robertson as "one of the best"